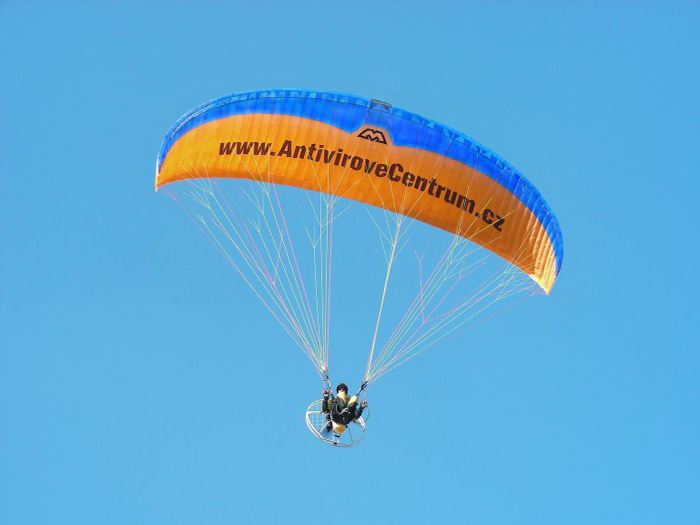 The Velvet is a unique paramotoring glider and was designed for a wide range of intermediate and advanced paramotoring pilots looking for relaxed flying. Easy launching and landing, a high amount of stability and a good cruising speed is what makes the Velvet one smooth ride! The slim elliptical form of the canopy has an aspect ratio of 5.5. The Velvet has 56 cells with full diagonals. Lines are attached to every third rib and this construction allows the lines to be reduced to two tiers. The serial production version of the Velvet is equipped with rear-riser trimmers with a 5 cm range to compensate torque (-2 cm to decelerate the glider and +3 cm to accelerate the glider). Additionally the risers are split to facilitate “Big Ears”. The positioning of the outermost “A” line makes progressive closure easy. Easy launching characteristics are typical of all MacPara gliders. The research and development team paid extra attention to the handling of the Velvet during take-off and how well it flares for landing. 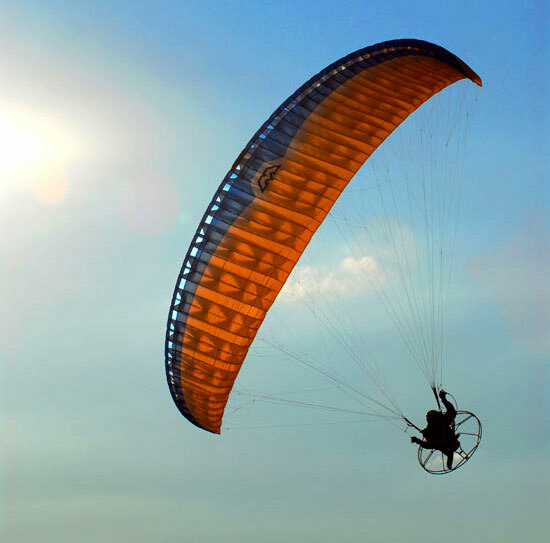 The final design offers the pilot easy landings in nil-wind conditions even when heavily loaded. The light brake pressure allows pleasant turns during long flights, but increases progressively toward the end of its travel to offer safety reserves. 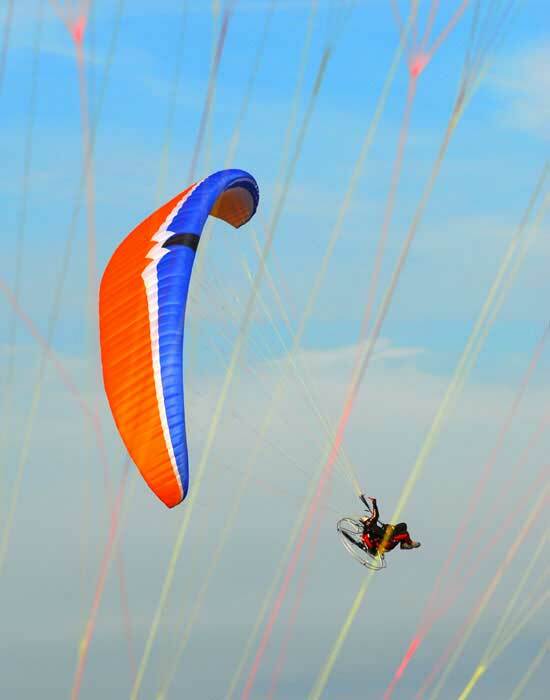 The glider is undemanding and resistant to collapse even in rough air thanks to the customized semi-reflex airfoils. It features excellent stability throughout the full weight and speed range. The canopy is moderately damped in all axes and offers flexibility and agility in turns. It does not overshoot or sit back. The Velvet can also be flown without a motor making it two glider in one. Thanks to the serial trimmers, its sink rate can be decreased. 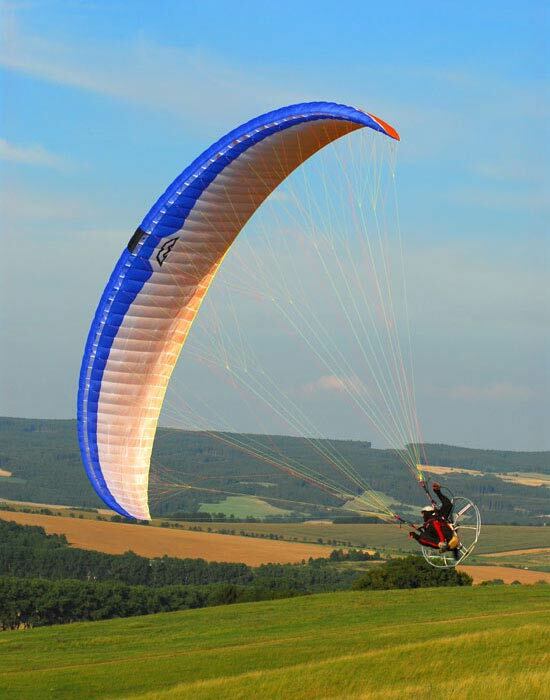 With closed trimmers is its climbing performance is at a similar level to normal paragliders. With this baby you can soar in light lift, thermal in all conditions, and do cross country flights. A perfect all around glider with plenty of performance to enjoy. Great attention to small details had to be addressed to make this happen. The Velvet is equipped as standard with especially soft brake handles with magnetic clips and Velcro. We don’t use swivels on the Velvet brake lines to minimize the risk of damage to the propeller if the handle contacts it. Another benefit is when you place the handles on the risers in flight or during take-off preparation is much easier than traditional snaps. Velcro closures on the wingtips make access easier to remove any sand, grass or small stones from the glider. The Velvet can be equipped with special PPG risers featuring a longer rear-riser trimmer with a +9cm range for additional speed. There is no EN Certification when fitted with these PPG risers. The Velvet is available in three sizes and covering a total weight range of 85 to 190 kg. Please check the specifications for full details. The use of high-quality materials and constant quality control throughout the manufacturing process produces high quality products. 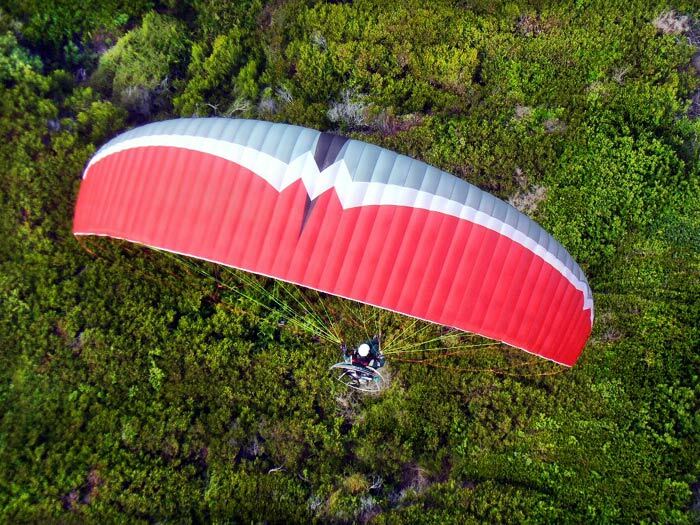 You will feel good know you are flying a MacPara Paraglider like the Velvet. Aerial magazine was privileged last November, to test a prototype of the Velvet, a glider produced by Mac Para Technology for release in early 2008. With this semi reflex profile, the Czech producer will probably establish a strong market position quickly with this enjoyable and functional product. Easy to inflate, light on the brakes and dynamic on handling, the Velvet should seduce a majority of pilots, even though its certification is predicted to be in the intermediate category. It’s the logical addition to the Eden and Spice models, already appreciated for their performance. It will be sold in three sizes, 23/26/29 with a weight range from 90Kg to 150Kg. As usual Mac Para took their time; over a year, in order to produce a product with the brand’s usual abilities. Easy take-off, sweet landing and precise handling were required to join an expanding market. Worked out to the tiniest detail, the Velvet has special PPG risers with thinner brake handles, designed to suit any type of machine. 6 cm long rear trims allow slower and faster flying, although most of today’s pilots might prefer longer ones. This short trimmer system is the result of a security concept within the homologation scales. Nevertheless, longer trimmers can be ordered, but pilots choosing this option will lose the security of EN certification. Nevertheless, the speed difference is obvious with the longer trimmers, and they will please a bunch of sport pilots. A jewel! I must sincerely admit that this inflation is among the best! 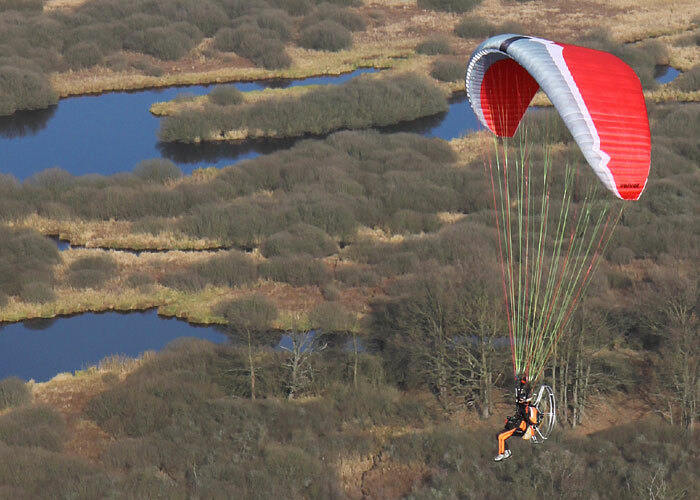 The canopy climbs regularly and fast, without over-shooting. In nil-wind, it is the best gift one could wish for. The Velvet’s profile is certainly not a pure reflex, and the take off is probably a positive consequence of this. 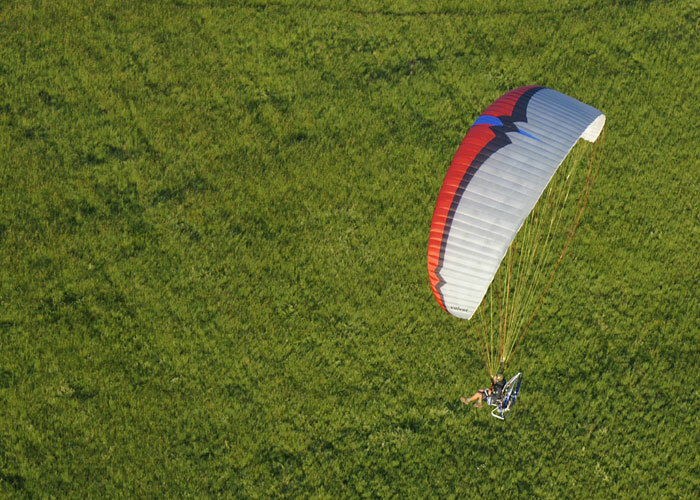 As far as many PPG pilots have take-off difficulties, they will probably love this hybrid paraglider, in which they will find the best compromise. The climb is fast and reliable. The gear was loaned to Sebastian Blanchon, a pilot from Lons-Le-Saunier, during the “Raid Maroc”, and he still has warm memories of his flight. After flying for almost 2 hours over sand dunes, he had to land due to his empty tank. He said being seduced with an intense smile. So was Ewald, a long-established pilot who knows the brand’s characteristics pretty well. Having already flown the Eden and the Spice from Mac Para, I recognized the Brand’s usual touch. An agreeable feeling of safety; almost non-existent propeller-torque; precise handling; and reactive controls will satisfy most pilots. Spinning 360° and curves are happening, and backing to stable flight is being done naturally, with a good sight control due to the speed. Turns are easy without any tendency for collapse. Because we had no chance to fly in strong thermals during the tests, we can’t comment on the Velvet’s reliability in turbulence. 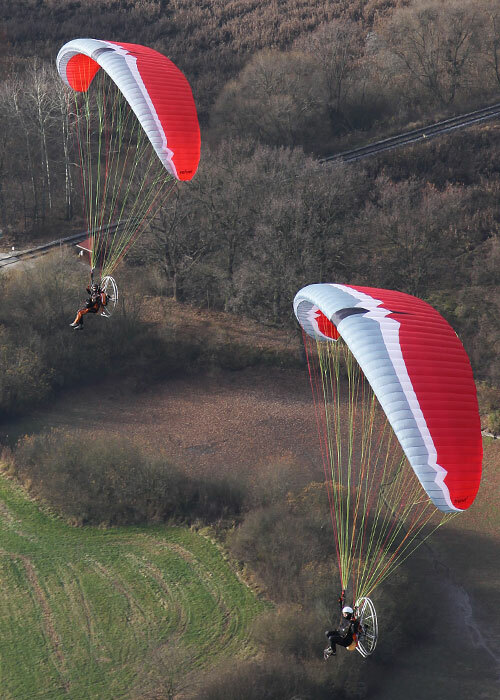 With factory homologated trims closed to the slowest speed, the Velvet reacts similarly to free flight paragliders: climbing in thermals and dynamic lift will be precise. Fuel will consequently be saved. With open trims, maximum speed is not as high as expected, that’s why the addition of non-homologated one’s should be considered. Landing is soft and easy, with no need for big brake inputs. Mac Para has thought about everything for you. The Velvet is not a replica of others pure reflex profiles, and should be recommended to anyone, for their greatest pleasure. Designed in three different sizes for a big weight range, its EN certification should only be an administrative job. Like all new MAC PARA gliders the topsail is a mixture of materials with different coatings. 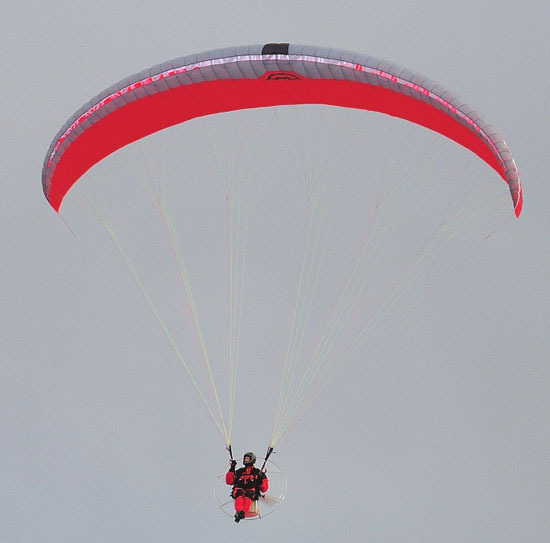 The Velvet is manufactured using the paragliding industries well established lightweight material with excellent durability; Skytex 40, from Porcher Sport (NCV). Because for any glider, the part that always wears out first is the leading edge, we use Skytex 40 with double water repellent E77A coating for this. For less stressed parts of the sail we use Skytex 40 with E38A coating. For main ribs and diagonal ribs we use Skytex 40 with E29A “hard finish” coating. The different parts of the design are assembled to keep the cleanest canopy. Top lines are made from GIN Aramid/Kevlar TGL line-series of different diameters. The 5 point risers are are made from 25 mm polyester prestreched strap. The brake handles have magnetic clips, velcro and a swivel attached steering line.